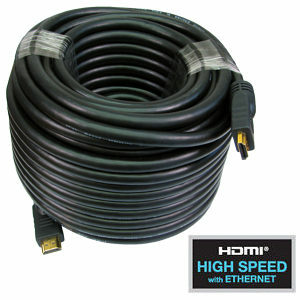 25m HDMI Cable Active Extra Long High Speed with Ethernet. High Speed with Ethernet Cable. Micro USB socket TV end to apply optional extra power if required. 2 Way Automatic HDMI Switch Allows you to connect up to 2 HDMI devices to a single HDTV display or projector. 2 HDMI inputs, 1 HDMI output. Supports 12-bit Deep Colour. 24k Gold plated connectors. Multifunctional switching : Intelligent/Manual. Resolutions up to 1080p. Computer resolutions up to 1920x1200. HDMI/HDCP pass-through. Built in 56cm HDMI cable on switch output. Compatible with Blu Ray DVD Players, Sky HD, PS3 XBox 360 Freesat HD, Virgin HD and many more.